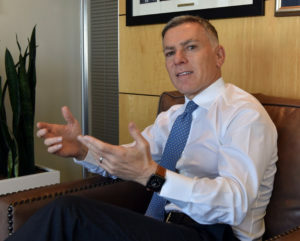 Adrian Gore is a South African entrepreneur, founder and group chief executive of Discovery Limited. He was born on the 16th of May 1964 in South Africa. He launched Discovery in 1992, with the aim of making people healthier and enhancing and protecting their lives. He was born on the 16th of May 1964. As of 2018, he is 54 years old. He got married to Lauren Gore in 1987 and together they have two children. He has a fortune which is estimated at around R7 billion all thanks to his shareholding in Discovery. In 2017, he took home a total salary of R17 million, including a basic salary of R6.2 million, and a performance bonus of R3.6 million. This figure was down from the initial R18.5 million the chief executive received in 2016. 2013: He received the Manex Award from the University of the Witwatersrand Business School. 2010: He was named as the Sunday Times business leader of the year. 2004: South Africa’s leading CEO in the annual MoneyWeb CEO of the Year Awards. South African Jewish Business Achiever Award. 1998: South African Best Entrepreneur, Ernst & Young.